Get information on and locations of geomagnetic observatories operated by the USGS and partners of the USGS geomagnetism program. 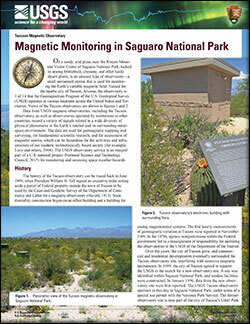 The USGS Geomagnetism Program currently operates 14 magnetic observatories. Magnetometer data are collected at these facilities, and the data are then transmitted to Program headquarters in Golden Colorado. 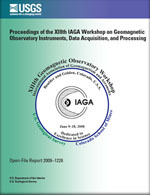 The geographic distribution of the Program’s observatories, shown below, has been determined by the need to monitor and study the geomagnetic field on a global scale, primarily for purposes of space-weather diagnosis and main field modelling and mapping, as well as the practical issues of availability of land, communication and operational logistics, and the relative locations of observatories operated by other foreign-national programs. Explore all of the USGS Geomagnetic observatories with this Google EarthTM download or browse each one below. Map of USGS Magnetic observatory locations. 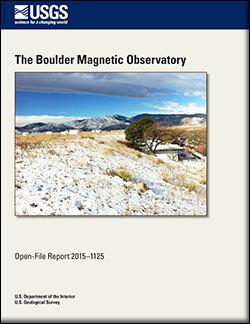 The Boulder Geomagnetic Observatory, Physics Today 16, 8, 66 (1963); doi: 10.1063/1.3051083. Herzog, D.C., 1992, Geomagnetic Data from the U.S. 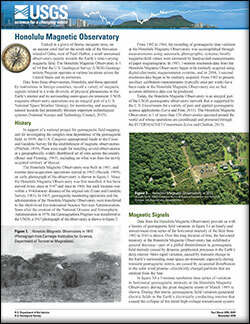 Magnetic Observatory Network, in NASA. Goddard Space Flight Center, Types and Characteristics of Data for Geomagnetic Field Modeling p 321-332. Poedjono, B., C. Finn, B. Worthington, 2011, Deadhorse Magnetic Observatory (DED) (1.5MB PDF), presentation. Schneider, C., N. Zinn, 2013, Applying real-time magnetic declination in arctic marine seismic acquisition (1.7MB PDF), Geology & Geophysics. Townshend, J., 2001. Fifty years of monitoring geophysical data at Barrow, Alaska, Fifty more years below zero, Ed: Norton, D. W., The Arctic Institute of North America, University of Alaska Press, Fairbanks, 61-64. Worthington, E. W., J. J. Love, 2002. Geomagnetic field monitoring at Barrow, Alaska, Climate Monitoring and Diagnostics Laboratory, NOAA, US Dept. Commerce, 26 , 166-170.